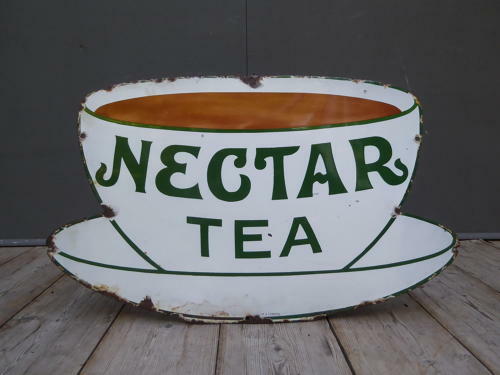 A fantastic early vintage enamel advertising sign for Nectar Tea. A wonderful, iconic enamel sign which was once commonplace on railway station platforms up & down Great Britain. Manufactured by The Patent Enamel Company & a fabulous decorative piece which is getting harder & harder to come by! Wear commensurate with age, good overall with the usual wear & minor loss to the extremities, unrestored & displays beautifully.